A few years back, director David Lowery hooked up with actors Casey Affleck and Rooney Mara for the critically acclaimed-yet-criminally underseen Ain’t Them Bodies Saints. Since then, Lowery has made the reboot of Disney’s Pete’s Dragon, Affleck has won an Academy Award for Manchester by the Sea, and Mara has been nominated for one for Carol. Longing for simpler times, Lowery, Affleck, and Mara are all back together again, putting their big, ambitious projects aside for the very minimalistic indie A Ghost Story. A Ghost Story stars Affleck and Mara as a couple, known only by the initials “C” and “M,” who are very much in love, but are going through a rough patch in their relationship. When C is unexpectedly killed in a car accident (literally at the entrance to the couple’s driveway), he comes back as a ghost, white sheet with eyeholes and all, to haunt the home that he shared with M. M can’t see him, and although she mourns her lost love, she goes on with her life, while C’s spirit watches her the whole time. Eventually, M moves out of the house, but C is bound to the location, and stays through other tenants and conditions, destined to spend eternity as a ghost in his former home. The concept behind A Ghost Story is a simple one that revolves around love, loss, and loneliness. And Lowery and company execute that concept very well. The audience feels sympathy for both the ghost that is doomed to wander his old house for eternity (even after the house is long gone) and for the survivor who has to try and carry on without her soul mate. It’s a very quiet and somber movie, with about half of the dialogue provided in a single scene where a drunk philosopher (referred to in the credits as “Prognosticator” and played by Lowery pal/folk musician Will Oldham) rambles on about art and creation and timelessness. The shots are long and observational, putting the audience through exactly what the ghost is going through by showing them everything that goes on (at one point, the camera fixes on Rooney Mara eating a pie in an unbroken take that is probably eight minutes long – just her chomping away at a pie for what feels like forever while C looks on in the background). There’s a detached timeline in A Ghost Story, one that’s as repetitive and monotonous as a ghost’s existence would actually be. For as one-note as A Ghost Story gets, it’s a very enjoyable movie that, clocking in at a tad over ninety minutes, knows exactly when to get out. It’s artistic and esoteric, but in a way that is completely accessible to people who don’t consider themselves artistic or esoteric. It’s not stuffy or elitist just because it’s a hip and cool indie film. There are some issues with the ending, mainly timeline things that will make the viewer question everything that they think they know about ghosts and the afterlife. However, they’re the type of issues that should inspire thought and dialogue rather than rage and anger. Love it or hate it, A Ghost Story will have its audience thinking about it long after the lights have come up. Thanks to the cinematography of Andrew Droz Palermo (You’re Next, Rich Hill), A Ghost Story boasts a very distinct photographic look. The most instantly obvious choice that Palermo and Lowery made in regards to the look of the film is to shoot in the almost square aspect ratio of 1.33:1. This gives the movie an old-school, vintage feel, almost as if the film was shot on an 8MM home movie camera, and that aesthetic is magnified by the fact that the frame of the sometimes grainy image has rounded edges. Palermo uses soft focus in many shots, so that the ghost is just a bit out of focus while the camera captures the heartache and despair of his widow. 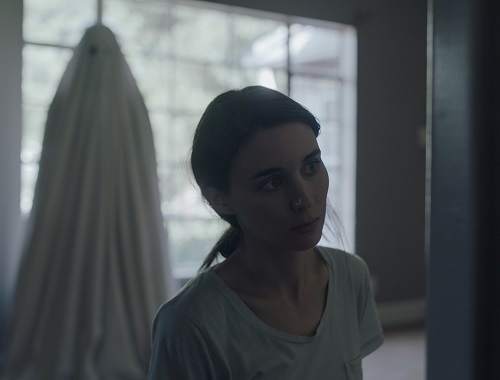 A Ghost Story is full of slow, long, drawn out takes that let the action unfold naturally, which gives the film an improvisational feel – it almost seems as if Palermo rolled film and Lowery shouted things like “eat that pie, and go!” to the cast. 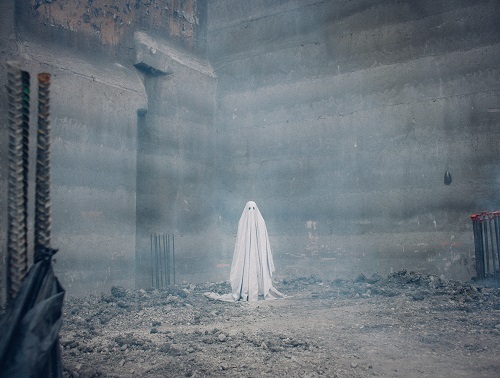 Between the technical aspects and the artistic choices, the cinematography in A Ghost Story is a huge part of the film’s timeless and melancholy vibe. The musical score for A Ghost Story was composed by David Lowery’s usual suspect Daniel Hart, who, in addition to scoring all of Lowery’s films, also did the music for the television show “The Exorcist.” The soundtrack to A Ghost Story is much closer to the dissonant strings of “The Exorcist” than it is to the happy, down-home folk of Pete’s Dragon. The score is electronic, full of synthesizer drones and sparse melodies, with just a touch of rhythm and percussion (there’s even a Roland TR-808 drum machine in places). 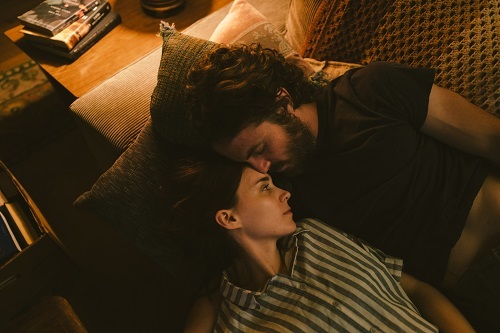 At the center of the film’s soundtrack is an electronic pop song that’s supposed to have been recorded by Casey Affleck’s pre-ghost character in an effort to communicate musically and artistically with Rooney Mara’s character. The song is actually performed by Hart’s group, Dark Rooms, and it’s a heavily produced and layered track that sounds exactly like what’s it’s supposed to – something a talented musician would record on their home midi studio. It pops up repeatedly in the film, and while it’s not exactly catchy, it’s the kind of tune that the audience looks forward to hearing again whenever it shows up. And, because it was written by Hart, it fits in perfectly with the rest of A Ghost Story‘s score. The first thing that anyone who is interested in seeing A Ghost Story needs to know is that it is in no way, shape, or form a horror movie. There’s a ghost in it, and he does some spooky stuff, but there’s absolutely nothing scary about A Ghost Story. It’s much more of a melodrama, a love story, even a dark comedy, but it’s not a horror film. Which is totally fine – David Lowery did not set out to make a horror film, and he didn’t end up with one. But just be aware; just because the word “Ghost” is in the title, doesn’t mean there will be any scares in A Ghost Story.